Is it a butler? Is it a personal assistant? No, it’s a smart fridge – and it’s pretty darn cool. Let’s be honest, refrigerators haven’t always been the sexist appliance in the home. From retro-style Smeg stand mixers, to Roomba robot vacuums, a bulky white fridge has seemed a bit pale in comparison. But recent years have seen a rise of refrigerators with a stainless steel or stylish matte finish, and built-in designs that fit seamlessly into the kitchen cabinetry. The trend of smart fridges is no exception. See how brands like Samsung and LG reach the top of the class with their range of smart appliances, and learn how these products might be able to earn a perfect score with Aussie shoppers. So, what exactly is so clever about a smart fridge? Turns out, quite a lot. Smart appliances are created to make lives easier with seriously innovative functionality. These types of refrigerators tend to contain a versatile touchscreen interface, while many are capable of connecting to your Wi-Fi to operate certain functions, or sync with other smart appliances. Remote access is similarly a common feature, making it possible to adjust settings while you’re outside the house. What are some problems with smart fridges? 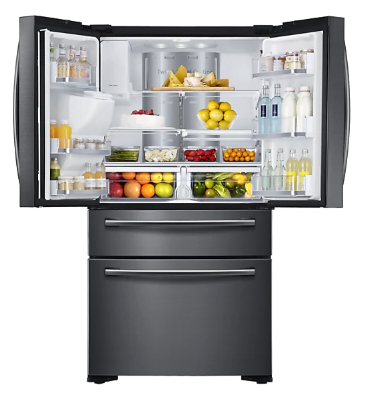 Don’t expect to see many smart fridges selling for as low as some affordable standard fridges, like the Esatto EUL237W Upright Fridge which retails for $499. LG and Samsung smart fridges typically cost in the region of $4,000. 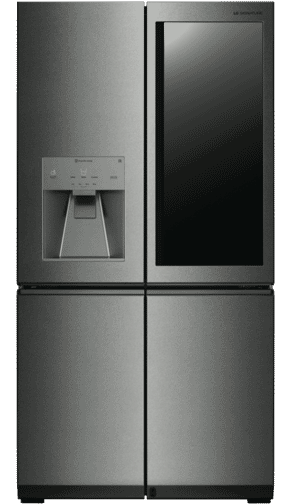 But keep in mind there are still ‘regular’ refrigerators, such as the Liebherr 585L Integrated French Door Fridge, that cost way more still. Like with all technology capable of syncing up to the internet, there are concerns of potential security issues. This is especially because the Wi-Fi the fridge connects to is likely to use the same password as you need to use your phone or computer. What smart fridges are available? 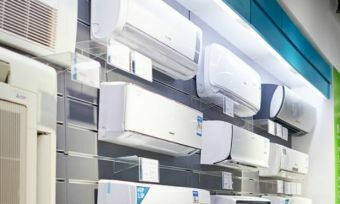 In Australia, appliance giants LG and Samsung are currently the main companies to have jumped on the cool bandwagon. Smart fridges are available from other brands like GE and Kenmore, although these are yet to arrive Down Under. Here’s a few products you can get your hands on today. The Samsung 651L Family Hub French Door Refrigerator is marketed as a personal assistant capable of ordering last-minute groceries from your local Woolworths, letting you know who’s at the door, and even check your calendar to remind you of your plans for the day. The large smart appliance can also provide a bit of TV entertainment or search the internet while you cook. What can the Samsung SRF651BFH3 do for you? Use built-in cameras to show what’s inside the fridge, and this can be accessed through either a compatible smartphone or via the screen of the fridge door. Between work deadlines, school pickups, birthday parties and that early morning soccer practice, who has the time to dig into the organised mess that is the family fridge? Thankfully, life’s good with smart refrigerators like this LG Signature model. Functions like the InstaView Door-in-Door allow you to peak at the contents inside, so you can peek inside and hopefully scramble over the shopping list a little less. So, what else can the LG fridge do for you? Remotely adjust temperature settings, provided you use the LG Smart THINQ app. The LG smart fridge has a 3-star energy rating, including 414L fridge capacity and 272L freezer capacity. The built-in ice dispenser can also carry up to 14L, with a filtered water dispenser also available. If you’re not cool with spending more than $4,000 on the latest trend of smart fridges, the LG 570L French Door Refrigerator is a lower cost option. And the GF-L570MBL model proves it’s not all about how you look, it’s what’s on the inside that counts. One of the standout features is the SpaceIce System, which is apparently aimed to balance storage and functionality. It’s designed to work like a usual 10L built-in ice maker, while also maximising the space to provide enough room for a wide-open shelf space and storage on the door. Another feature included is the Smart THINQ function, which allows you to adjust the temperature settings from your smartphone wherever you are. The LG 570L French Door Refrigerator has a 2.5-star energy rating, and provides 310L fridge capacity and 250L fridge capacity. Is a smart fridge for me? Between work deadlines, school pickups, and early morning soccer practice, it seems like there’s never enough time to dig into the organised mess that is the family fridge. Thankfully, smart fridges have your back. Knock twice on the mirrored glass panel of the LG Signature French Door Fridge with InstaView Door-in-Door and see what’s inside without actually opening the door. Need some ice cream? Order what you need from your local Woolies from the Samsung 651L Family Hub French Door Refrigerator – and while you’re at it, why not watch some TV from the fridge door too. If you really want to avoid lifting a finger, Panasonic teased the idea of a voice activated Moving Fridge in 2017. In theory, this would allow you to ask your refrigerator for a drink and it would literally bring you whatever you want. However, this concept is still in the works. But whatever you choose, make sure you’re getting the right one by comparing a variety of products and brands. Hit the link below to see plenty of helpful ratings and reviews.